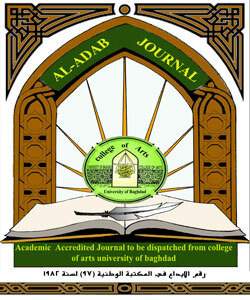 Background and Perspections of AL-Adab Journal Al-Adab jornal is a scientific academic and accredited journal of the College of Arts , University of Baghdad . It is edited regularly within a specific time . Four issues per year in March , June , September and December . The first issue was edited in March 1956 and was entitted " Al-Alum and Al-Adab College Journal " because at that time the journal was edited by the college of sciences and Arts before the splitting of the college into two colleges : College of arts and college of sciences . The publication of the journal under such title was continued , in each year one issue was edited . A ccordingly , the first issue was published in 1956 , the second issue was in 1957 and the third in 1958 . when the college of arts has become an independent college , i.e. after its splitting from the college of sciences , the first issue has been edited under the title of " Al-Adab Journal " in 1959 . the publication of the Journal has been continued till the oppressive blockade on Iraq causing the journal to stop for five years . After this compulsory stoppage the publication of the journal was resumed in 1990 . in order to achieve its goals in publishing the scientific and the intellectual products of researchers , learners and thinkers . It can be noted that the goals of Al-Adab journal extend to include many researchers and learners outside the College of Arts ( from other scientific institutions ) as well as researchers outside Iraq . In fact , the editorial board aims at making fruitful interaction and deepening the intellectual , scientific and cultural perspectives . Al-Adab journal is specified for publishing the researches and studies related to different and various human fields like Arabic and English linguistics , Criticism , Literature , History , Geography , Psychology , philosoghy and Anthropology . the researches prepared to be edited are submitted to an accurate linguistic and scientific evaluation by sending them to specified experts to make sure of the validity of the research topics and contents and then the researches are evaluated to be published or not in the journal . Thus , many ersearchers have great confidence in publishing in this journal due to its distinctive status in the Iraqi educational prospect and also due to its connection with the college of arts – university of Baghdad , which is know by its rich inheritage represented by its immortal symbols including great professors , scientists and thinkers , And this gives the journal a distinctive status as an intellectual andscientific stand for all sciences and this leads to deepen the educational interaction and communication within human and culture perspectises . Accordingly , researchers will get great benefit in presenting varions opinions and discussions to develop their abilities in many fields of knowledge . اضاءات عن مجلة الاداب مجلة الاداب مجلة علمية محكمة تصدر عن كلة الاداب جامعة بغداد بشكل منتظم وضمن توارخ محددة بواقع أربعة اعداد في كل عام ، موزعة على اشهر اذار وحزران وايلول وكانون الاول . وقد صدر العدد الاول من المجلة في حزران عام 1956 ، وحمل اسم (مجلة كلية الاداب والعلوم) لانها حينذلك كانت تصدر عن كلية الاداب والعلوم ، قبل انشطارها الى كليتي الاداب والعلوم ، واستمر اصدار المجلة بهذا الاسم في كل عام 1957 والعدد الثالث في حزيران عام 1958 وحين اصبحت كلية الاداب مستقلة بعد انفصال العلوم عنها صدر العدد الاول من المجلة عام 1959 حمل اسم مجلة الاداب ، وبقيت المجلة تواصل ظهورها ونشاطها الى ان اضظرتهاه ظروف قاهرة الى التوقف لمدة خسة اعوام ، بسبب الحصار الجائر الذ كان مفروضا على العراق ، وبعد هذا الانقطاع الاضطراري ، عاودت الصدور عام 1995 لتواصل مهمتها ف احتضان المنجز العلمي والفكري للباحثين والدارسين والمفكرين وتجدر الاشارة الى ان مجلة الاداب يمتد افق عملها الى باحثين ودارسين من خارج كلية الاداب في مؤسسات علمية اخرى ، فضلا عن باحثين من خارج العراق ، اذ تسعى هيئة تحرير المجلة لادامة التفاعل والتواصل مع الباحثين وتعمين اواصر التلاحم الثقافي والفكري والمعرفي . والمجلة متخصصة بنشر الابحاث المتعلقة بالدراسات الانسانية في مجالات اللغة والاداب والنقد والتارخ والجغرافية والاجتماع وعلم النفس والفلسفة والاثار ، وتخضع الابحاث المعدة للنشر فيها الى اجراءات التقويم العلمي واللغوي بارسالها الى خبراء متخصصين لبيان صلاحيتها للنشر على وفق ضوابط محددة هدفها التحقق من رصانة البحث ومتانة محتواه ليكون مستحقا للنشر في هذه المجلة التي وضع الباحثون ثقفتهم بها ، فجعلوا النشر فيها خيارهم المفضل لما تشغله من موقع ريادي مميز في حركة الثقافة العراقية لاقترانها بكلية اداب - جامعة بغداد المعروفة بعراقتها وبغنى ارثها الابداعي المقترن برموزها الخالدين من اساتذة افذاد وعلماء اعلام ومفكرين اجلاء مما منح المجلة وسام التألق والتميز لتصبح منبرا ثقافيا وفكريا ومعرفيا وتبقى وعاء يحتضن مزيدا من باقات الابداع الفكري والمنجز العلمي والتواصل المعرفي ضمن افق انساني حضاري تتفاعل فيه الافكار والثقافات عبر رؤية معرفية نقدية يأنس اصحابها بمحاورة الاراء ومناقشة طروحات الاخرين ليكون ذلك منطلقا لترسيخ مقومات الابداع والاجادة في شتى ميادين المعرفة . A Scientific Peer-reviewed journal published by the Islamic Researches and Studies Center in the Iraqi University. It is specialized in publishing the scientific researches of different specialties such as Islamic sciences, law , media , history, administration , English language , education , economic sciences , Arabic language and arts. هي مجلة محكمة يصدرها مركز الدراسات والبحوث الاسلامية في الجامعة العراقية. وهي تعنى بنشر البحوث العلمية في مختلف الاختصاصات في الشريعة والقانون والادارة والاقتصاد واللغة الانكليزية واللغة العربية وادابهاوالاعلام والتاريخ والتربية والعلوم الاقتصادية. صدر العدد الاول للمجلة عام 1993. وهي تصدر بمعدل عددين في كل سنة. Humectations Quarterly Journal, College of Arts, University of Kufa.The Journal had been established in 2008, the first issue had publishedin Jonuary of 2008 , to be a scientific Journal of Humanities with the International serial No. (19948999), . since its first issue three editor in chiefs occupied this position :- prof .Dr. Abd Ali Hasen Al- Khafaf . And prof .Dr. Hasen Easa Al- Hakeem and Assist .prof. Dr. Alaa Hussain Al- Rehaimy and Assist .prof. Dr.Hadi Abdul - Naby Al- Temimy The Journal aimsat diffusing the cultural and scientific awareness in all the Humanities fields aswell as publishing the faculty members researches for the promotion purpose .Due to its High scientific efficiency , it attracts many researchers from Iraq and out of Iraq . It is Worthly to say that the Journal is issued auarterly , grants the researcher afree copy of the issue that carries their researches. تأسست المجلة عام 2008 فصدر منها العدد الاول في كانون الثاني من تلك السنة وعدت مجلة علميةانسانية محكمة تحمل الرقم الدولي (19948999) ,وتوالى على رئاسة تحريرها منذ صدورها حتى الان كل من 1- الاستاذ الدكتور عبد علي حسن الخفاف 2- الاستاذ الدكتور حسن عيسى الحكيم 3- الاستاذ المساعد الدكتور علاء حسين الرهيمي 4-الاستاذ المساعد الدكتورهادي عبد النبي التميمي وسعت المجلة منذ صدورها الى نشر الوعي الثقافي والعلمي في الاختصاصات الانسانية كافة فضلا عن اسهاماتها في نشر بحوث الاساتذة لغرض الترقيات العلمية ,وللرصانة التي تتمتع بها فقد استقطبت عددا من بحوث الاكاديمين من خارج العراق . ومن الجدير بالذكر ان المجلة تصدر بشكل فصلي وتمنح الباحثين (عددا +مستلات )لبحوثهم المنشورة في تلك الاعداد ومجانا. Literature, poet, grammar, absolute. Islamic history. Islamic characters أدب, شعر, نحو, صرف. تاريخ اسلامي. شخصيات اسلامية. A Refereed academic journal specialized in modern languages. مجلة أكاديمية محكَّمة تُعنى باللغات الحديثة وآدابها. مجلة فصلية محكمة تعنى بالأبحاث والدراسات الانسانية تصدر عن العتبة العباسية المقدسة صدر العدد الاول مطلع عام 2012 .